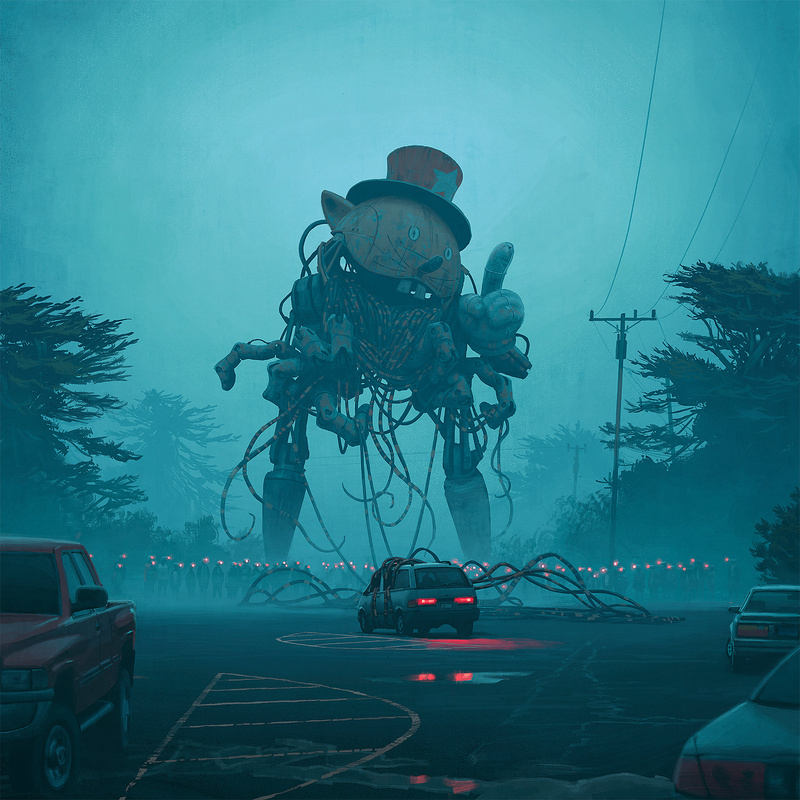 The alternative history artist Simon Stålenhag turns his attention towards the US. I’ve never had any real relationship with art. Whether it’s a painting, a sculpture, or something that simply looks hastily thrown together minutes before the exhibition opened, none of it has never really been able to catch my interest. Not even the 130 kg sea of blue candy. Everything has fallen into one of three categories: “Meh”, “not nice”, or “confusing”. Yes, when it comes to fine art, I’m a simpleton1. But a few years ago, I discovered an artist whose work struck a chord with me. Swedish multi-talent Simon Stålenhag, who I also wrote about back in 2015, makes amazing works of art. By taking science fiction and alternative history elements, and putting them into a familiar 80s and 90s settings, he has very effectively caught the attention of his – and thus my – generation. 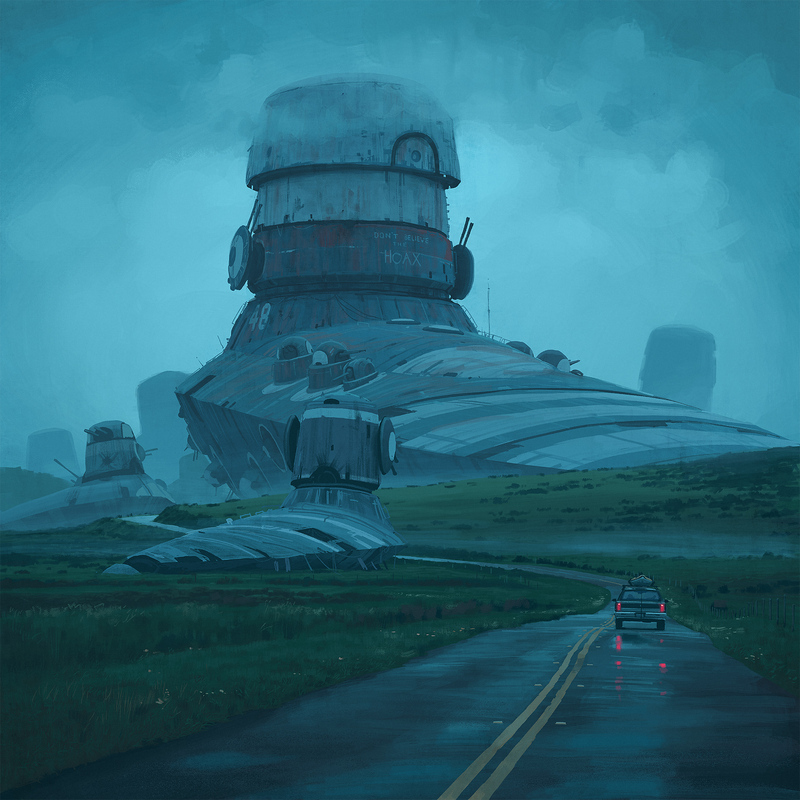 After a very successful Kickstarter campaign two years ago, Stålenhag has released two books. In both “Tales from the Loop” and “Things from the Flood“, he mixes his paintings with an intriguing narrative. If you, like me, grew up in the 80s and 90s, Stålenhag’s paintings will trigger your imagination by themselves, but with the addition of the book’s narrative they really come to life. And now there’s third book project in the works: The Electric State. According to an interview Vice did with Stålenhag, The Electric State is “a road trip journey of sorts, […] set on the highways and streets of an alternate rural California of the late 1990s.” Like the author’s previous work set to a science fiction induced 80s and 90s rural Sweden backdrop, the paintings for The Electric State are amazing. I love how each digital painting tell a thousand stories. They are “novel-esque” to quote the Vice article. Huge, abandoned war machines. A hundred people wearing gloving red VR headsets connected to a massive robot. Two detectives standing besides a body at a border crossing. Who? When? How? Why!? The paintings are smörgåsbord of inspiration and triggers for any imagination. I also love how Stålenhag plays with lights, fog, weather, and the scenery. The man has an obsession with street lights, and it shows. The painting used as header image in this particular entry is a good examples. Good stuff. If you want to stay up-to-date with the progress of The Electric State, you should follow Stålenhag on Twitter. He shares a lot of his work, and does a great job interacting with his fans. Exactly when The Electric State will be available isn’t quite clear, but another Kickstarter campaign might or might not appear this summer. And that information is coming straight from the horse’s mouth. Many of Simon Stålenhag’s paintings are available in wallpaper-friendly sizes directly from his website. It’s all there on the front page. How much he pays each month in bandwidth I don’t know, but I imagine it’s quote a lot. High quality prints can be bought through the author’s Redbubble store. One day, I’ll be the proud owner of one. And probably on a number of other subjects as well. I wonder how many chameleons snuck on to the Ark.